A Look at Homelessness Here and on the National Stage - CARITAS - Shelter. Jobs. Recovery. Hope. During the past year, CARITAS has provided shelter to 488 people. Each one has a story. Allie Cornell, LCSW, knows this well. She has been working with shelter residents at CARITAS since 2014. She’s sat down one-on-one with residents of our shelter to help them connect to resources like health care, find housing, and build a plan for self sustainability. “We’re always focused on finding the most effective pathways for residents to sustainable housing,” Allie says. Like many of our staff members, Allie is an expert in her field. She represents CARITAS as a leader in Greater Richmond’s Continuum of Care in partnership with organizations like Homeward. Together with other agencies focused on homelessness and housing, she helps define and design a system that maximizes resources in our community to reduce the numbers of men, women, and families experiencing homelessness. “It’s so important that we stay in touch with our own data, share it among each other, and compare it to national trends and statistics,” she says. Allie’s dedication and expertise has taken her to the national stage. 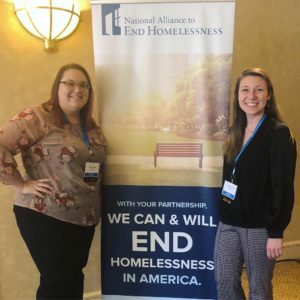 She recently presented at the National Alliance to End Homelessness National Conference in San Diego. She detailed CARITAS’s mobile shelter history and our transition to a permanent shelter site. “It was important to share that every change and every move we make has the client in mind,” Allie says. During the past year, Allie has led an evolution of our shelter service model to better serve men and women in need. Changes included transitioning our men’s mobile shelter to a permanent location at 700 Dinwiddie Avenue and transitioning our family shelter residents to other agencies in the city. The benefits are already evident. For example, more than 70% of our shelter residents are employed now, compared to 28% before the beginning of the transition a year ago. Until 2020, CARITAS will continue to provide shelter to women through its current mobile shelter option in partnership with area congregations. As we move forward in 2019, CARITAS will focus its efforts on providing shelter and recovery services to single men and women based on our success and knowledge of this population. We’re proud to have team members like Allie leading the way, making informed decisions for our clients and the community based on research, results, and compassion. In honor of National Social Work Month, we thank you, Allie! We extend our gratitude to everyone in the human services and social work profession in our community. For more than a century, you and those before you have been on the cutting edge of helping create changes to make our society a better place to live.